It’s time to announce our ASAO hamper raffle winner. Thanks to all who visited our stand at the ASAO conference 2016 in Torquay. It was great to see so much interest in ShowBiz and it was a pleasure showing everyone. You can read about our time at the conference here. Plenty of people entered their business cards for a chance to win our Suffolk Food Hall Festive Hamper. 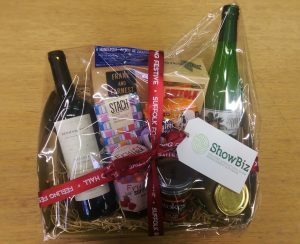 However, there can only be one winner and we are pleased to announce that Diana Walton, Assistant Shows Manager at the Three Counties Show, will be receiving the hamper. Once again, thanks to all who entered their cards and came and spoke to us about all-new ShowBiz. All-new ShowBiz is packed with powerful features, so stay tuned for the latest information ahead of its launch.